Stuart has reached the second aid station on the run, as the chasing group exit transition. Our leading pro women are nearing the transitions area, still only seconds apart. Andrea and Parys are on the run, as Lucie enters transitions. Stuart managed an average pace of over 41 km/h on the bike. In our pro mens race, Michael Davidson has moved into second place with Travis Johnston in third. 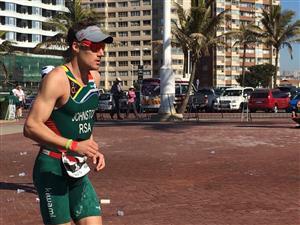 Rudolf and Freddy are in 4th and 5th respectively chasing down Michael and Travis ahead of them. Andrea and Parys are still neck in neck almost a third of the way into the run. Stuart is half way with the run, and still going strong. Stuart is nearing the finish line, set to finish under 4 hours! 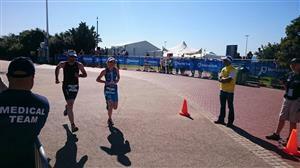 Parys has opened a small lead over Andrea, both ladies running strong. 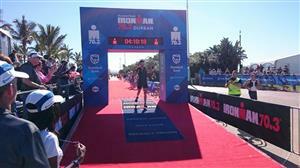 Stuart is heading into the finish, will he break 4 hours? Michael Davidson finished in second, having a great run! Lucie is in third, as she heads into the final kilometers of the run. 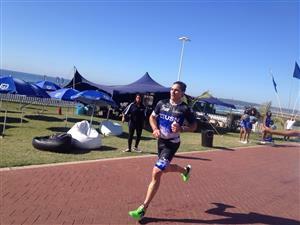 Rudolf Naude has finished in third position, followed Freddy Lampret in fourth. Parys Edwards is still comfortably in first as she begins the last 5km of the run. 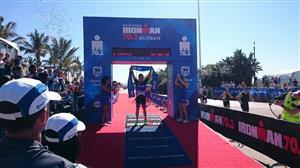 Congratulation to Parys Edwards winning the Standard Bank Ironman 70,3 Durban. Lucie has finished in third position, crossing the line with a big smile on her face. The run course is packed with our amazing age groupers all hoping to complete the race, and hopefully set personal bests. 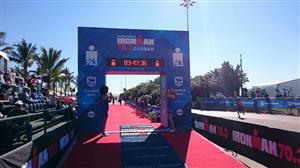 Local rugby legend John Smit had an amazing bike, completing the 90km course in 2:46:59 at an average pace of 32.34 km/h. 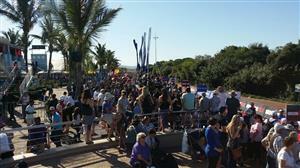 The finish line party is in full swing, as we welcome home athletes of all age and shape. 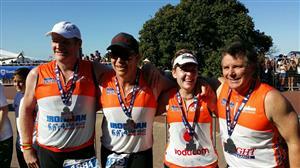 Well done John Smit, local rugby legend racing in the colours of Ironman 4 the kidz charity. We've entered the final hour of racing, waiting for the tail end of our age groupers to come home. 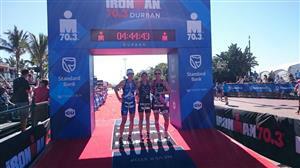 We've reached the end of the Standard Bank Ironman 70.3 Durban. 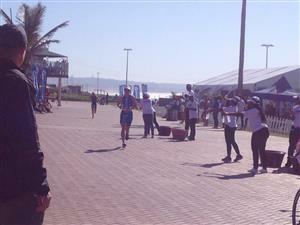 A few unlucky athletes missed the cut off, but that's not going to stop them from crossing the line. 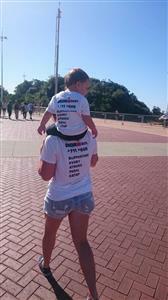 Ironman anything is possible! Thank you for following our coverage.